The Type column is used when the financial institution’s data has an amount column that has no sign on it, and it is the Type column/field that decides if the amount should be positive of negative. An example of the Filter column is below. 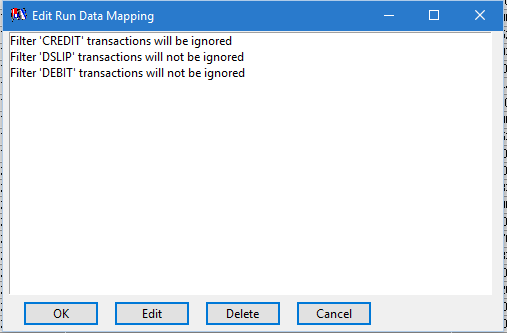 When you run the conversion ImportQIF and you are using the Type column and the data values are not Credit or Debit, ImportQIF will ask you if the data value should be negative. In this example charge was set to be negative and deposit was set to be positive. If you select one or more (use Windows standard list selection methods) of the lines in the list and select Edit, ImportQIF will ask you if the amount should be made negative or not. 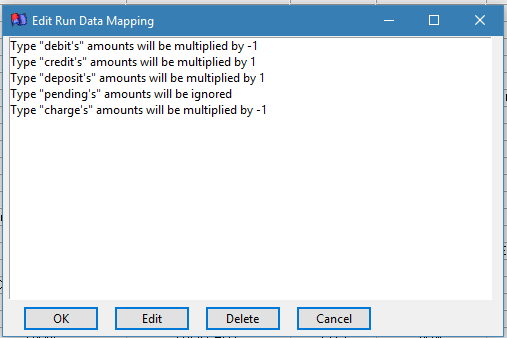 You can use Delete to delete a mapping, the end result being you will be asked again when you run the next conversion. The Filter column is used when the user wants to filter out some of the transactions. For instance there might be a column in the data that has pending or posted. In the example above I just used a column that the financial institution used for the type of transaction it is. And set it to ignore credits, but not deposits or debits. 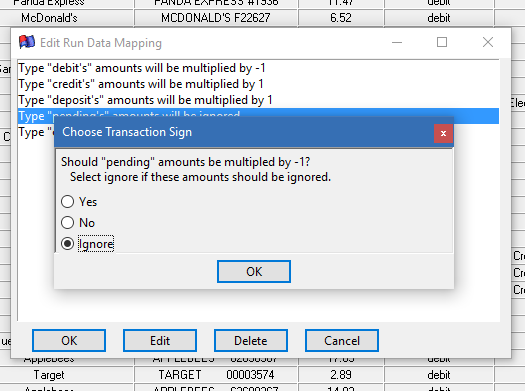 If you select one or more (use Windows standard list selection methods) of lines in the list and select Edit, ImportQIF will ask if you want to ignore transactions that have the given filter data.